Expires in 1mo . Last validated 4d ago . Used 8 times. Daniel Cross I am validating that this deal work perfectly. Just apply the promo code at the shopping cart and get 20% Off Your Entire Order at JOJO's Chocolate (Site-Wide). Marjorie Rios This deal was verified and it is working as described. Select the items and enter the promo code at checkout to get this discount. Some exclusions may apply. See the screenshot for more information. Lismary Jaramillo I am validating that this deal works as described. 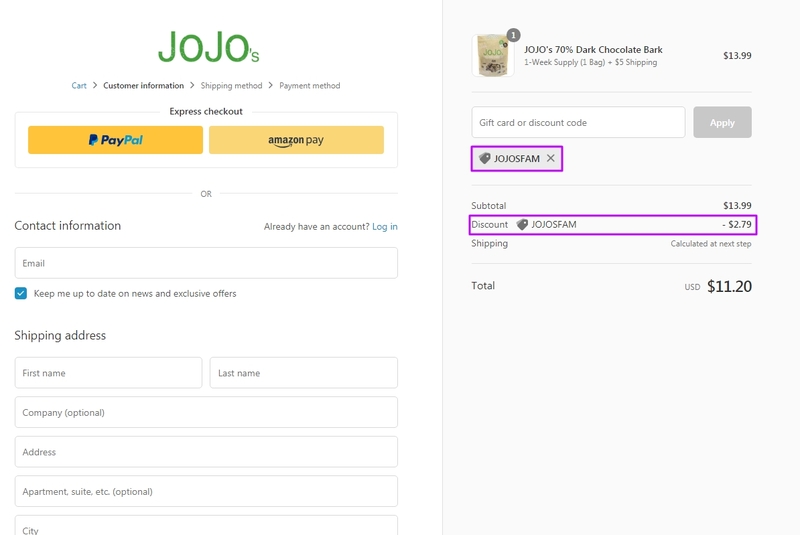 Just apply the promo code at the shopping cart and get 20% Off Your Entire Order at JOJO's Chocolate (Site-Wide). rosario nicomedes castro rondon This code is working as described, all you have to do is copy and paste the code at checkout to claim your discount. Lenin Piñango Simply go to the online store, add to the shopping cart any item that you want to buy, apply the coupon code during the checkout to get 20% Off. Offer ends soon. Some exclusions may apply. See screenshot for more information.